Infrared marked cards sunglasses maybe strange to many people while the normal sunglasses is always popular use all over the world, among young and old, men and women. When being outside of doors, people wear sunglasses to protect them from the sun. When being in casinos, the players wear sunglasses to prevent that other players might tell something from their eyes. The infrared sunglasses always have red filters built in into the lens of sunglasses so that it can see the invisible luminous ink marks of marked cards. Thus it is called luminous ink glasses as well. The outside of this infrared sunglasses can be disguised with a normal mirror tint so that others can seldom suspect on it. Users can use these infrared marked cards sunglasses to detect invisible markings on the marked playing cards. Infrared sunglasses are one of best playing cards cheating device with marked decks for magic shows of poker games without getting much attention by others. 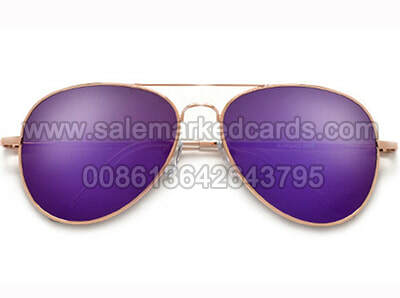 Infrared ink glasses refers to the infrared glasses with special light can see the infrared ink marks. It is short as IR sunglasses. Usually with naked eyes people can not see the infrared ink that only the special infrared filters can see. With this point, marked poker playing cards are used with the infrared glasses. only the infrared glasses or invisible ink contact lenses can see the luminous marks. Modiano marked cards, Copag marked decks, Ultimate Bicycle marked cards, invisible BEE playing cards, luminous ink KEM cards, Lion 3005 marked cards, Infrared Royal cards, Bonus marked playing cards, Fournier marked poker cards and so on, are available in our company for sale with infrared ink sunglasses. These are marked playing cards with glasses and have luminous invisible ink marks on the back. These are helpful and wonderful products for poker. Magic IR sunglasses are useful and reliabl. And now, the infrared sunglasses is much more than protecting themselves in casinoes. People who wear our infrared sunglasses can read other players' marked playing cards with numbers and suits! It is a ripe products for many years. And please note that the infrared sunglasses can read only the contact lenses marked cards, but not the barcode marked decks or infrared camera marked cards. ​What do you know about marked decks with glasses? In some extent, you can not take it as playing cards cheating products. If you love playing games in private poker club, you can use infrared sunglasses to check about if someone using marked luminous playing cards in game. Luminous marked cards glasses are a special useful tool of poker marked cards, it can work as marked cards reader or cheating cards detector. Glasses are the one of the most common accessory of any person nowadays with the so trendy range of glasses from classic aviator to shiny sunglasses available in the market. But with the ever increasing technology the manipulation of card games have become easy through the glasses with marked playing cards. We offers the vast range of marked playing cards with glasses at very reasonable prices. Our collection of glasses including the most trending to vintage sunglasses that will fully satisfy all your needs in the game of cards. To provide best quality products to our customers, the quality standards are very high at our marked playing cards with glasses shop. We have any model of infrared sunglasses for sale now. The marked decks with infrared glasses are widely used in the poker cheating area or magic shows. What kind of infrared sunglasses can you get?